The Common Finge myrtle is all but common in its beauty. 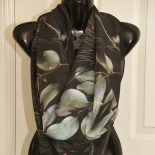 I designed this silk scarf from photographs I created last spring from nativeflora on the side of a road I travel often. I use this style as both a cowl neck scarf and a headband, particularly handy. Thank you Geoffrey for your kind words. Yes a lot of our flora is often so tiny that people would never see it! I am lucky to be able to combine two loves – photography and nature in my work. This entry was posted on June 15, 2018 by sharongreenaway in #art for sale, #bendigo, #flora, #photography, #photography as an artform, #sharongreenaway, Art for sale, bendigo, commercial work, FASHION, flora, photography, photography for sale, quotes available and tagged #wearableart, art, austalian landscape, australia, bendigo flora, environment, golden landscape, goldfields, native flora, wearable art, work.